Work by two artists from Devon, Gill Jones and Helen Lee, will be on show at the Plough Arts Centre in Torrington, this Summer. The show is entitled ‘Out and About’ and features landscapes and seascapes inspired by the beautiful sea, coast and countryside of North Devon. Gill and Helen use a variety of media including watercolour, acrylic and several printmaking techniques. They often work together enjoying creative co-operation but retain their own individual styles while creating harmony throughout their joint exhibitions. Please call to check opening times before making a special journey. The duo are long-standing participants in North Devon Art Trek and 2016 is no exception. No sooner will their exhibition be over than they will be setting up their studio for the two weeks of the exciting NDArt Trek open studio event. For their Art Trek details click Gill Jones and Helen Lee. 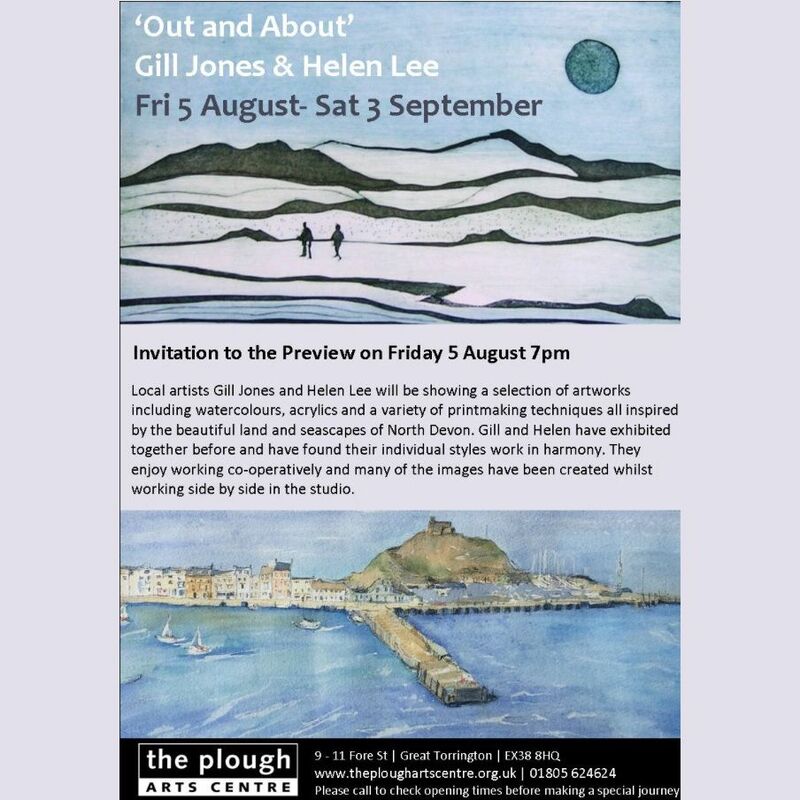 Gill and Helen will host a preview of the Plough exhibiton on Friday 5th August at 7pm. All are welcome. Don’t miss this opportunity to meet the artists and enjoy their work! Have you ever been to an exhibiton at the Plough? Do you know Gill’s or Helen’s work? Please tell us about your experiences in the comments below. Wishing Gill and Helen all the best for their forthcoming exhibition. Here’s hoping to be able to welcome lots of you at our preview on 5th. It’s all hung and ready to view! My sister and I thoroughly enjoyed seeing your work at the preview and all the different styles and media you use. Thank you so much, It was well worth going. I wish you every success for the exhibition. Thank you so much for making the trip to see us. We were delighted that you came. We had a very good response from our other previewers too, so we thoroughly enjoyed the evening as well. All the people we spoke to at your exhibition were impressed and surprised at the variety and skills you both display – Visitors to your Art Trek event are in for a treat! We are looking forward to welcoming visitors to our Art Trek exhibition at Rosehill, the more so because of the great response we had at The Plough. Thanks to all those who came to The Plough.